The celestial equator is the great circle of the imaginary celestial sphere on the same plane as the equator of Earth. This plane of reference bases the equatorial coordinate system. In other words, the celestial equator is an abstract projection of the terrestrial equator into outer space. Due to Earth's axial tilt, the celestial equator is currently inclined by about 23.44° with respect to the ecliptic (the plane of Earth's orbit). The inclination has varied from about 22.0° to 24.5° over the past 5 million years. An observer standing on Earth's equator visualizes the celestial equator as a semicircle passing through the zenith, the point directly overhead. As the observer moves north (or south), the celestial equator tilts towards the opposite horizon. The celestial equator is defined to be infinitely distant (since it is on the celestial sphere); thus, the ends of the semicircle always intersect the horizon due east and due west, regardless of the observer's position on Earth. 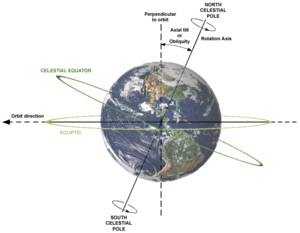 At the poles, the celestial equator coincides with the astronomical horizon. At all latitudes, the celestial equator is a uniform arc or circle because the observer is only finitely far from the plane of the celestial equator, but infinitely far from the celestial equator itself. ^ "Celestial Equator". Retrieved 5 August 2011. ^ Millar, William (2006). The Amateur Astronomer's Introduction to the Celestial Sphere. Cambridge University Press. ISBN 978-0-521-67123-1.